Hybrid Mobile Apps have taken the development scene by storm. Before this, Developers had to learn native app languages to develop, which at times had an incredibly high learning curve. 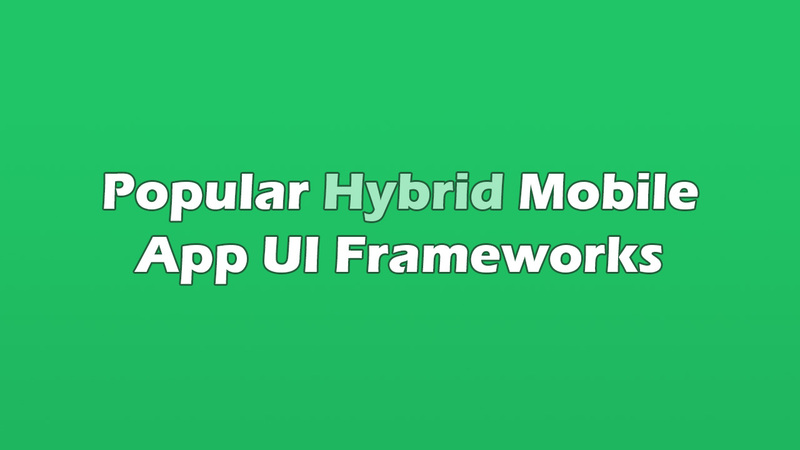 However with hybrid frameworks, it will make mobile app development faster and easier. Most of the frameworks use JS, besides HTML/CSS. An application program that has been developed for use on a particular platform or device. Because native apps are written for a specific platform, they can interact with and take advantage of operating system features and other software that is typically installed on that platform. A hybrid application (hybrid app) is one that combines elements of both native and Web applications. Native applications are developed for a specific platform and installed on a computing device. Web applications are generalised for multiple platforms and not installed locally but made available over the Internet through a browser. Hybrid apps are often mentioned in the context of mobile computing. Native Developers will always prefer to work with native code, but it is always time consuming and require extra effort. With native code, they will have to build the same exact thing for different platforms. Of course, the reliability is at the side of native code but business-wise, it’s not too feasible. The way to go is always hybrid for proof of concept, when concept has been proved, get another estimate for time and cost to develop the concept in native codes. For deliverance, native app development is needed to ensure stability besides reliability. Ionic has established itself as leader in the hybrid mobile apps development space. The development team keeps the framework updated by adapting to the latest trends, ahead of the competitors. Ionic is free to use and open source, moreover, its community has grown so huge that you can easily find resources. Ionic is wrapped by the Angular framework giving it the majority of its hidden superpowers. Ionic also utilises Cordova to go native for iOS, Android, windows phone and other platforms. Ionic framework is maintainable and scalable, uses clean and easy to read markup. It comes packed with highly mobile-optimised library of CSS (Powered by Sass), HTML and js components. It also features tools and gestures to ensure interactive apps development with ease. You can read more about Ionic at – ionicframework. Onsen UI utilises Angular directives and Topcoat framework for most of its UI components. Onsen UI like Ionic is open source and free to use, read more about Onsen UI at – onsen.io. Framework 7 leads the race among hybrid app frameworks in iOS mobile apps development space. Framework 7 doesn’t provide support for building cross platform hybrid apps. But it definitely is the finest and most feature rich framework for iOS hybrid apps development. You can read more about Framework 7 at its official website – Framework7. The die-hard jQuey fans community has built this minimalist jQuery Mobile package on top of solid jQueyr and jQuery UI foundation. jQuery mobile focuses on empowering developers to build web/mobile apps that run seamlessly with unique user experience across devices. It doesn’t focus much on providing native look and feel to apps for individual platforms. You can read more on jQuery Mobile at – jquerymobile.com. With Mobile Angular UI, you get best of both Bootstrap 3 and Angular framework to build HTML5 mobile applications. Angular UI is like an extension to Bootstrap 3 but without any dependencies to bootstrap js or jQuery. It utilises fastclick.js and overthrow.js for smooth and better mobile experience. Mobile Angular UI provides directives for building UI components These essentially are the components that you find missing in Bootstrap 3 for building mobile apps. Mobile Angular UI is available as open source and free to use under MIT license, you can get the source code at github – mobile-angular-ui. Read more about Mobile Angular UI at official website- mobileangularui.com. Famo.us/Angular is another powerhouse HTML5 apps development framework and targets to provide near native experience in hybrid apps. The main difference between Famo.us/Angular and other hybrid HTML5 frameworks is that it focuses more on graphics rendering, 2D and 3D and hence is more suitable for games development. Read more about Famo.us/Angular at official website – famous.org. So those are the list of some of the popular mobile app UI frameworks available. Let us know which one you would prefer and why. If you have any other opinion regarding the list , we would love to have a chat with you!